Le Pays des Illinois, the country of the Illinois, was named for the tribe of Indians that the French missionaries encountered along the Illinois and Mississippi rivers. First explored in 1673 by Father Jacques Marquette and Louis Jolliet, it became part of the large Louisiana colony in 1717. In the early 1700s French colonists traveled down the rivers from Canada to Illinois looking for new areas where they could obtain furs and hides and trade with the Indians. Settlers also came directly from France under a three-year work contract with the Royal Indies Company. When they completed their contracts they could remain if they wished and receive a grant of land. Some workers were brought over from France because of their skills as blacksmiths, roofers, carpenters, and other trades. They practiced these occupations in Illinois, but they also supported themselves by farming and trade with the Indians. Although the opportunity to obtain free land in the New World might have sounded very appealing since land was scarce in France, there were drawbacks. The missionaries—the Jesuit priests—sent accounts back to France about their work, their accomplishments, and also their tragedies. Reports about people being waylaid on the rivers, and Indian massacre and torture made it difficult to recruit French settlers. Although the Illinois Indians and others were friendly, there were tribes who opposed the French. Some were groups affiliated with British traders in North Carolina and Virginia. The British urged the Indians to prey on the French because the British were anxious to expand their trade territory westward of the Alleghenies. The trip to New Orleans was known to be hazardous too. The ships were small, crowded, and often carried inadequate supplies of food and water. The passengers were fortunate if they had thin straw mattresses to sleep on. The crowded and unhealthy conditions on the ships led to disease, and many people died. And their troubles were not over if they did arrive at New Orleans; there was the Mississippi River to ascend on the return trip. Pirogues-huge hollowed out tree trunks-were used for transport. These were filled with supplies, the settlers' goods, trade goods, the paddlers, and the settlers themselves. One account records that the only space left to sit was on top of all the goods, and there they could not move for fear of overturning the vessel. Indian attack was a great danger, and submerged logs could capsize the pirogue. Heavy rains and wind could make the trip more miserable; worst of all were the mosquitoes! If travelers survived all this, they landed in the Illinois to begin their new life in one of the French villages—Kaskaskia founded (1703), Fort de Chartres (1718-719), Cahokia (1699), Prairie du Rocher (1722), and St. Phillippe (ca. 1723). In those villages, a man could receive a one or two arpent wide (an arpent equals 192 feet) strip of land stretching inland 40 or 50 arpents from the Mississippi River. These lands were in what was called the common field. Each person had his own land but was obligated to build a portion of fence where it bordered on the King's Road. In the winter the cattle and horses grazed there on the stubble from the crops. In the spring the animals were removed to the common, a pasture shared by all inhabitants. A grant to one man by the governing Council is summarized here: "The Provincial Council on the request of Jacque Catherine to grant him land to settle upon. We have granted to him one arpent of land by fifty in depth ... on the condition that he shall settle there and improve the land." Then, of course, he had to clear the land for farming by removing trees, brush, or lowland prairie grasses, and construct his portion of the fence. His house, though, would be in the village with all the other inhabitants. The settlers lived together in a compact village, not out on their farms. The village provided protection from roving Indian bands and the kind of social environment that the French families desired. were said to be tall, pleasing to look at, and industrious. One of the Indian wives was Marie, daughter of the Kaskaskia chief Rouensa, who converted to Catholicism. She and her husband, Michel Philippe, were active in the community life, and their children later married into many of the prosperous French families. Another group of settlers that was shipped over without their consent was black slaves. If they survived the trip and reached the Illinois Country, they were far more fortunate than those who were sent to the sugar plantations in the Caribbean. Slaves were valued more in the Illinois Country; they provided labor to assist in clearing land and farming. Therefore they were well treated. Their rights were protected by the Black Code, a law code defining the rights of the slaves and the duties of the owners. Among other provisions, the Code forbade the separation of families having young children, commanded that they should be fed and clothed properly, and directed that they should be instructed in the church and that elderly or sick slaves should be cared for. Slaves could earn money; possibly a few were able to purchase their freedom that way. Emancipation by owners also occasionally occured. The Black Code stated that the free blacks would "enjoy the privileges of other native born subjects of our kingdom." They could own land and contract for work. One free black man was a trader who hired Frenchmen to go on voyages. He apparently had other training as well, since he was paid for giving medical treatment to a Frenchman. The church was important in the life of the colonists. Unlike the British colonists on the east coast, the French did not come here for religious freedom. They came from Catholic parishes in France, and everyone attended a Catholic parish in the Illinois. After mass the official proclamations of the government were made outside the church door; auctions were held and group decisions were made on many matters. In theory both free blacks and widows were qualified to join in these discussions; there is no indication whether they did or not. As the Black Code provided the rules for slaves, so did the Coutume de Pahs for the French. The "Custom of Paris" was the law in effect in the French capital. One section of this law protected women's property and economic benefits. Following the rules of the Coutume, a marriage agreement was written before a couple married. Any property and the dowry that a woman brought to the marriage remained hers; her husband could not sell or dispose of it. (This was in great contrast to practice in the English colonies). When a man died, his estate was divided in two; half went to the wife and the other half was divided between the children. Widows were legally empowered to manage their own property, act as official guardians for their children, conduct business and make agreements. One woman even hired a voyageur and went trading. Following a man's death, an inventory of household goods, clothing, and real estate was made; items were listed with their value in order to make the division of the inheritance between the widow and children. The items listed were those that the couple owned jointly. Any property belonging solely to the wife was omitted from the inventory, including her dowry or other items agreed on in the marriage contract, such as jewelry or things specifically given to her in the agreement. One such item often was the couple's bed—a bed with curtains, mattresses, blankets, pillows and other bedding, frequently including a buffalo-skin coverlet. The quality of life in eighteenth century Illinois was quite good. There was no shortage of food; settlers not only were able to grow good crops in the rich bottomland soil and raise domestic animals, but they also enjoyed plentiful wild foods and game. Land was available to anyone who wanted to work it. There was no unemployment; there was always a shortage of labor, the colonists being few in number. D'Artaguette, an inspector in the country in the early 1700s wrote: "This country is one of the most beautiful in all Louisiana. Every kind of grain and vegetables are produced here in the greatest abundance .... they have, also, large numbers of oxen, cows, sheep, etc., upon the prairies. Poultry is abundant, and fish plentiful. So that, in fact, they lack none of the necessaries or conveniences of life." shingles. Generally there was a porch on two sides of the house and often on all four sides. The windows had many small glass panes and wooden shutters. Inside, a stone fireplace provided for cooking and heat. The walls of the house were plastered and whitewashed. Window curtains and rugs are mentioned in some inventories. There were tables, armchairs, side chairs, beds, chests, and armoires (large cupboards in which to store clothes). 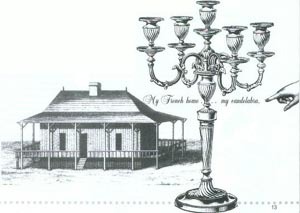 Some homes had mirrors, silver goblets, or a candelabra. Plates were made of pewter or faience, a glazed earthenware. Fragments found in archaeological work have an off-white glaze; decorative borders in blue are common. Platters and soup tureens were painted in bright colors with floral patterns. Clothes were both practical and fashionable—Indian moccasins as well as women's high heeled shoes, leather garments as well as others of silk, satin, and linen. A man in knee breeches, matching silk stockings, shirt with ruffles, a smart wool coat and felt hat, and a woman in a striped satin overdress lined with taffeta wearing silk hose and mitts are not the usual picture of frontier life. The French did not weave, so they did not wear homespun, and they liked good, colorful clothes. Some of the other fine clothing was for men: a vest of coffee-colored wool, a beaver hat trimmed with silver, a vest with silver braid and buttons, a pair of gloves, silk handkerchiefs, and a pair of pocket pistols. For the women, coifs (caps) of black and crimson, a pinafore, a dressing gown and petticoat of taffeta, embroidered shoes, and a quilted petticoat. The children's clothes were not listed in estate inventories; apparently those belonged to them. Unfortunately, this means there is very little information about their clothing. However, from other sources we know that the children's clothes were a smaller-scale version of the adult ones. An early-nineteenth century list of clothing that was provided by Jean Baptiste Barbeau to the orphaned Tanguis children gives an idea of what they wore. Over a period of two years, Catherine, the eldest, received: linen for three blouses and two skirts, cotton for a skirt, "ratteen" (a heavy, napped woolen fabric) for a skirt and short cape, calico for a skirt and short cape, and four pairs of shoes. Her brother Joseph, about twelve years old, received: linen for three shirts, heavy cloth for an greatcoat, linen for two pairs of breeches, "ratteen" for a greatcoat, and one pair of shoes. The youngest, Francois, received: linen for three shirts, cloth for a greatcoat, cloth for breeches, cotton for two shirts, linen for breeches, "ratteen" for a greatcoat, gingham for two shirts, one pair breeches, and two pairs of shoes. in Prairie du Rocher, as there is a record of students that were boarding with families there. In 1760 in Kaskaskia there is a record of a schoolmaster, Francois Cottin, who made a contract to teach a daughter of the Aubuchon family to read and write. The document also states that she was to receive two sessions per day, so that must have been the usual classroom periods. The good French way of life ended in 1765 when the British took over the Illinois country. The French and Indian War in North America, or the Seven Years War as it was called in Europe, began with skirmishes about 1754. Although at first the war went well for the French in the New World, Quebec fell to the British in 1759, and Montreal in 1761. The French were also defeated in Europe and in India; the Treaty of Paris was signed in 1763. The British received the east bank of the Mississippi River except for New Orleans; the Spanish acquired the west bank by secret treaty. Because of Indian warfare, the British troops did not reach Fort de Chartres until 1765. That event marked the end of the French colonial period. Life under the British, the Virginians, and finally the Americans changed French laws, customs, and language—and finally the French themselves. But those people who survived the dangers and diseases stayed on, raising families whose descendants still live in the area. Names of some of the early settlers can still be found in the modern telephone books-Duclos, Barbeau, Dufrenne, Roy, and others-not only in the local area but in other parts of the United States where people later moved. And some of the customs that they brought from France survived too. A three-day celebration held just before Lent became Mardi Gras in New Orleans. There was the King's Ball that was held on January 6th, the day of the Epiphany. A cake baked for this had four beans baked in it. The cake was served to the men, and the first man to get a bean was King for the year and he got to choose his queen. The other men who found beans were his courtiers. This ball was held in Prairie du Rocher until World War II; it was revived in 1976; later Cahokia and Ste. Genevieve also restored the custom. The custom most people identify with the French in the Illinois Country is a song, La Guiannee, that was sung on New Years Eve. In the old days people walked from house to house singing this song, collecting food for the poor, and garnering promises for dances to be held before Lent. This has not disappeared either; La Guiannee still is sung on New Year's Eve in Prairie du Rocher, as well as in Ste. Genevieve and Old Mines in Missouri which were also part of the Illinois Country. So, a little of the old French colony still survives today. Immigrants came to what would become the United States for a variety of reasons. The French were mainly interested in the economic opportunities presented by the Illinois Country. Travel was treacherous, but the conditions in the settlement were surprisingly good. Food and jobs were plentiful. Women and slaves had rights. The United States is a nation of immigrants. Without immigration we would not have a diverse society. Students will have an opportunity to learn where their forefathers came from and the reasons why they made the risky journey. The following activities can be used in units about the birth of our nation as it applies to the development of Illinois. The activities may be appropriate to the Illinois State Learning Standards 16.A .2b, 16.C.3a,16.D.2a, 16.D.3,16.E.2a, 16.E.3a, 17.C.3a, 17.C.3c,17.D.2b,and18B. Lesson activities are designed for junior high students. Begin this lesson by activating the student's prior knowledge. Based on what you know about early European settlement of the New World, answer the following questions: Why do you think the French came to the Illinois Country? What types of people came? What was the journey like? How could new immigrants make a living? What living conditions did they find once they arrived? How were women treated? What rights did they have? How were black slaves treated? What type of connection did the French have with the local Indians? After students have discussed their predictions, they should read the narrative portion of the article. As they are reading the article, they should check to see if their predictions are correct. If their predictions are not correct, they should adjust them. Activity one gives students the opportunity to debate the pros and cons of making the treacherous journey to this new country. When the students have read the article, introduce them to the Discussion Web handout. In the middle of the page is the question that students will be discussing. Divide the students into groups of two. Students will be discussing the pros and cons of coming to this new land. It is important that the students understand that they are not taking a side. They are just brainstorming reasons on both sides of the diagram. After the pair has had some time to work on the problem, the teacher combines groups. At this time there should be four people in each group. This group then evaluates their findings and comes up with a summary. One spokesperson from this group will explain the findings to the class. As the findings are presented, allow the class to discuss their findings as a group. Students should now pretend that they have a sister living in New Orleans. They are going to create a letter to her persuading her to come to Illinois. Students must use the information from the group discussion in the letter. The French have decided to come to Illinois. They arrive here in pretty good shape. Now it is time to learn about these interesting people. Students need to read back over the narrative portion of the article and answer the questions in Activity 2. After they answer the questions they are going to create a character from the following to role-play: a French man, a French woman, or a black slave. The teacher is to decide whether this will be done orally or in writing. Review the key concepts of the lesson with the students. Use masking tape to map off a house of the actual size of the time. Have students spend time in this area to understand the size. Students can then write what they think it would be like to live in this home with their family. Make a cross section of a home on poster board. Have students draw in the belongings. Have students select one item from the home. Write a detailed story about how they were able to get that item. Also have them assess the importance it has in their life. Compare and contrast wheat farming of the French colonists and today's farmers. Research can be done on the Internet. Students should search under the history of wheat farming. Draw and color a French man and a French woman. Label each item of clothing that they are wearing. Research can be done on the Internet. Students should search under eighteenth-century French clothing. They could also design clothing that they feel would have fit into this period. Assessment of this lesson can be achieved many ways. Important concepts can be assessed through each of the activities. Written or oral examination can also be used. Should you make the risky journey to Illinois? You have decided to come to Illinois. You made it here in good shape. Now what? Go back over the narrative portion of the article and answer the following questions. What kinds of jobs would a French man have? Who might be his wife? What types of rights were French women guaranteed under the Custom of Paris? What kind of home would they have? What types of possessions might they own? What would their lifestyle be like? What kinds of jobs would black slaves have? Why were they lucky to be in Illinois and not the Caribbean? What were some rights that they had under the Black Code? Now that you have learned a little more about the people of this era, let us slip back in time to the 1700s. Select one of the following: French man, French woman, or black slave. You will role-play your selection. Your teacher will decide whether this will be done orally or in writing. Be sure to include as many of the details listed above in your project. Also explain why you made your selection. Creativity is the key in this type of activity.